Brief:- In this first exercise, you’ll use fragments of still life images to create a combined design. Arrange a still life set-up that includes a background (preferably an ironed white or black sheet) and three distinct objects. It would be helpful if at least one object was sized at least 0.5m or you’ll be photographing everything in macro. Use either sunlight from a window or one single source of electric light to cast shadows and bring out the 3D form of the objects. Photograph around the objects, both close and wide shots, not all from the front. Capture the edges and the lines of the objects as well as defined shapes within them – for example the sound holes of a violin. Capture edges where light and shadow create a sense of depth or recess. Take pictures of the textures and colours of the objects. Think of this project as collecting impressions and perceptions of these objects and let this guide your camera. You’ll need approximately 20 well-exposed images. The idea behind this exercise is to imaginatively combine the different photographs into a single conclusive design. Have a look at some Cubist paintings and sculpture as inspiration. Notice how one object blends into another and how different viewpoints of the same object co-exist in surprising ways. The classic example of this is Picasso’s combination of the front and profile of a face, as in Weeping Woman, which you can see on the Tate’s website. Then look at Brendan Fowler’s Spring 2011 – Fall 2012 on the New York Museum of Modern Art (MOMA) website, which attempts similar arrangements with photography. Combine the photos by arranging prints or by using Photoshop to assemble the images as different layers. Cut the images and choose only fragments of each image, matching up lines so they flow and placing shapes in meaningful juxtapositions as defined points in the composition. You should find the composition grows into a large picture. When you’ve finished the design, photograph it or save it as a finished picture. The final result is not as good as I would have liked, and I certainly could go back an rework this photo. It doesn’t fulfill the brief in relation to cutting and layering parts of different images to combine shapes and planes. What it does do is make use of parts of three different photos, which have been shot from different perspectives, using the same single light source and turned them into a fourth photo. It hints at the kookaburra being created out of the shadows of the other subjects. I followed a YouTube tutorial on pixel dispersion to mingle the shadow from Action Man with that from the first kookaburra. It took a while to get used to, and once complete I felt the image was somewhat flat. I decided then to make use of the third bird, to see if I could make it appear as if it was being formed from the shadow. The result is OK. Now that I have an idea of how to use the technique I could make better use of it in the future. I haven’t followed the brief if you’re a purist, but I am pleased with my interpretation. Brief:- Make a series of photographic studies of light and shadow. Use your spot meter to expose the highlights correctly, but make the shadows dark. Use the edges and corners of your frame to create dramatic compositions. You’ll need to shoot many exposures for this project, perhaps more than you’re accustomed to taking. Be observant and go out specifically with taking pictures in mind. Notice:- Sun streaming light in through windows, the way trees cast their shadows, patches of light cast through trees and shrubs, angular shadows across city streets. I have really enjoyed this project and I have become more accustomed to notice what is going on around me, more of a feel for noticing people walking through highlights, and aware of how dark areas in a photo can create a mood. For this project I have been out on several occasions and taken test photos on my smart phone which can be seen here. In fact one of my favourite photos was a test shot taken on my phone. The shadows on the wall do not come through well on the image, but to me its a message of hope. Being stuck behind a dark barrier, with light and colour on the other side, and a stairwell leading out, an exit. The rest of the photos were made on my D7100, and have had some adjustments in Lightroom, dodge, burn, increase shadows, and crop. These are the photographs that I think work the best because of the light and composition, and I am aware that 1 and 3 are more on the lines of silhouette than working with light and shadow, but in saying that they show good use of highlights and darks. I rarely convert my images into black and white, but I am pleased with how it works with the train. Here are a few more that I liked. I like the shadow of the bike and how it is framed against the shadow cast by other street furniture, and the second photo, the leading lines, angles, perspective and composition. Brief:- Put your camera on a tripod or stable surface. Set to manual mode. Make a photo of anything you like at the optimum exposure according to the light meter reading. Now deliberately under-expose by one f-stop or by reducing shutter speed (e.g. 1/30th sec to 1/60th sec). Take another shot, underexposing by an f-stop. Now take a shot over-exposing from the initial optimum exposure by one f-stop or increasing the shutter speed. Take another shot over-exposing one stop further. Upload these photos to your computer to view them better. I followed the brief as outlined, but have arranged the photos from under exposed to correctly exposed and then over exposed. For most series I took five images. I will begin with my favourite series. I do not like photographing in churches, as the light meter on my camera does not work properly when I am shooting in higher ISO settings. I initially tated with an ISO of 800, but with the light setting showig the correct exposure, the image was over exposed. So I dropped down to ISO 640, and underexposed by 2 stops. I was using a tripod, my camera set to spot metering, and white balance to cloudy, and apature at f10. The focal point was the stained glass window. The initial photo was taken at 1/60sec and the final image at 0.5sec. It is really apparent that there are details in the highlights on the first image, and the colours can be made out in the stained glass window with hardly any light or detail in the shadow. The final image has detail in the shadow and is correctly exposed for the areas nearer to the camera and the ceiling, but the rest of the image is over exposed, the window highlights have some clipping and that creates flare on the stained glass. I have then opened the images in lightroom and combined them to make an HDR image, with auto tone, removed chromatic abberation and enabled profile corrections. Finally I used the vertical transform to correct the uprights. I have not made an HDR image before so I am really pleased with the result. Learning:- buy a remote trigger so that I do not have blurring from the movement of pressing the button, and shoot in MUP (mirror up). The second series was taken the same way but without a tripod. Image 1 – f5 1/10sec- Image 5 – f5 0.4sec – all images ISO 800. The HDR image is of poor qaulity, I was not using a tripod, so the lights are blurred. I had the ISO to high for this series. Here are the other series that I made for this exercise. The key learning for me has been to ensure that I use a tripod wherever possible. I do not always take one with me and I need to do this more often. I could increase the ISO and use faster shutter speeds so that I reduce handshake, but that does not work when bracketing exposure. For bracketing images, where the focus is to take the same photo with different exposures, a tripod is a must. The point of bracketing exposures is so that you can review the detail in the highlights and shadows in different images, and then develop them from the photo that has the detail in the area that you wish for it to be. Bracketed exposure also leaves the ability to create HDR images, where you can retain detail and smooth exposure through the whole of the image, and again, to do so a tripod is required. Increasing the ISO for a single where exposure compensation is not required, can be useful to use a faster shutter speed and eliminate vibration, but increasing the ISO means that the sensor has increased sensitivity to noise, so grain will be increased. I am very pleased with the HDR image of the church – but I must use a remote shutter release. Before you start this exercise, have a look at the work of Trent Parke. Not all, but a lot of Trent Parke’s photography is in black and white, and this is certainly a good way to reinforce highlts and shadows, but it is also a good way to demonstrate perspective and depth. I found that many of Parke’s photos have a mood attatched to them which is emphasied in monochrome. His Dream/Life series has a morose and rather depressing feel in many of the images, although there are some with a more warming feel. I sometimes get worried about the grain in my photography, but many of Parke’s images have grain, which I find adds texture and does not take away from his photography at all. First thoughts on Dream/Life:- Perspective, Depth, Activity, Grain, Silhouette, Evening, Autumn, Winter, Joyless. Context, perspective, timing, height, smallness. The timing of this decisive moment is excellent and I expect Parke had planned this image so that he got the right time of day when the sun would shine between the two skyscrapers. He may also have had to return to the scene so that he would get the person running past the highlight between the shadows. Viewer, leading lines, hesitation, autumn, winter, despondent. That could be me in the photo, or any viewer, although I am sure that the reaction that I had to this photo is based upon my dislike of getting wet. The man has a shirt on, probable after work, on his way home. The emotional impact of this photo is more important for me that Parke’s technical ability, and that demonstrates how good this photo really is. I am studying photography and my aim is to evaluate this photo so that I can improve my own photography, and yet the evaluation is rendered secondary. The man in the left, the leading lines taking the eye across the road to the silhouettes walking away, through the heavy rain. The quick shutter speed that catches each drop of rain, and again, the hesitation to step into the rain. Excellent composition. Battlefield, war, space, silhouette, detail in the highlights, use of caption. All of the photography that I have seen from Parke on magnum has a caption, and it works for this image. It does not work on all of them though, or at least I question whether it is necessary on them. From my perspective the captions in Parke’s photography on magnum do not add to the photo, especially as my mind will focus on the words first and then at the image. It detracts from my ability to respond to the photo from my own perspective. Once I have read the caption I am asked to view the image from Parke’s perspective, and then try and stay with the photo long enough to become immersed in it. Parke’s photography does not have the caption added on in-public and this works better. I certainly prefer the style of Benjamin Lowy in Iraq Perspectives (2011), where there is only a brief caption at the beginning of the book and none with the photographs. Benjamin invites the viewer to immerse themselves in his photography and to dare to relate. First thoughts on The Seventh Wave:- Movement, Fine Detail, Ethereal, People. First thoughts on The Seventh Wave:- Shadows of People in highlights, Dodge, Burn, Perspective. Make a series of photographic studies of light and shadow. Use your spot meter to expose the highlights correctly, but make the shadows dark. Use the edges and corners of your frame to create dramatic compositions. You’ll need to shoot many exposures for this project, perhaps more than you’re accustomed to taking. Be observant and go out specifically with taking pictures in mind. Notice: Sunday streaming in through windows, the way trees cast their shadows, patches of light cast through trees and shrubs, angular shadows cast across city streets. Today we visited Pannet Art Gallery in Whitby as part of a family day out. It was not a planned study visit for me, but I thought I would take some notes for my studies – Foundations in Photography. I am preparing for the Workflow exercises on Shadow, so my focus was looking at shadows, highlights, contrasts and diffuse lighting. The exhibitions were predominantly acrylic, oil and water colour; there was no photography. Three artists caught my eye, although they didn’t necessarily fit the brief that I was researching. However – light is the medium of artists and photographers and without light we cannot create. The luminosity in the painting is more impressive than the photo, and there was slightly more depth in the shadows. The luminosity and shadow detail were what caught my eye. There is a richness and subtlety to the colours that appeal to me. I am aware that some of the photographs that I develop can appear HDR as I have a tendency to over contrast my images. Cook’s photo has an intense dynamic range that has also has a gentle quality. This was not the image on display at the gallery but the diffused lighting and broad tonal range are similar to those in his painting at the gallery. The colour saturation decreases gently across the frame but the vibrancy is consistent. 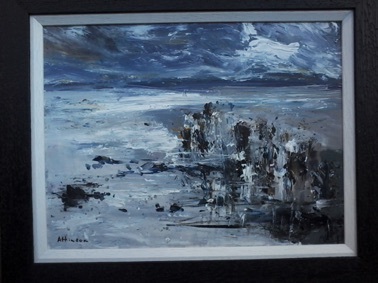 Sue Atkinson also had two paintings on display. She is a member of Leeds Fine Art Club and The Fylingdales Group of Artists. Again I must say that the photo of this painting really does not do it justice. The luminosity and the light were striking on the painting in the gallery. However, the learning for me was the importance of setting and position in relation to photography and other images. I first looked at this head on, and walked quite quickly past it. Then I sat down and spoke with a friend about 12ft away from the image and 4ft to the left. Then I really saw the lighting. Displaying my photography online will have its advantages, but it will also have drawbacks. Learning – Consider how best to display a series of photographs. What interaction do I want the viewer to be able to have? How can I make use of multi media and different environments with my photography? Foundations in Photography – Work flow – Project 2 Shadows. I have briefly looked at the work of Trent Park and Gabriele Brasco, along with reading the brief for exercise 1.6 – 1.9. I am in company this week so I was aware that I wouldn’t be able to focus as much as I wanted. However – this is perhaps better for my development. Instead of going ahead with preconceived ideas I have been able to use our days out to learn from the environment that we have visited, try some ideas, and now have two places to return to for the exercises. Learning – reading a brief and exploring a new environment with the brief in mind means that ideas develop naturally and I can then build my creativity into this. The light meter on my camera is inconsistent when my ISO increases and I must review an image to test my light meter. I don’t like taking photos in churches. I am not able to upload my camera test images at the moment but I have also explored a little on my android. I took this photo of the back cover of a book in a second hand book shop. I apologise to the author and publisher for not crediting your work – I didn’t make a record of the book title, author or publisher. An example of diffuse lighting – I photographed this photo inside the Natwest bank in Whitby on a day out. I have a few projects in the pipeline, but the next two that I am developing are on mental health and stigma, and social control. I have decided how I can move forward with these by making a montage and a magazine style documentary, and have collected more articles for this along with some exploratory photography. My homelessness project is an ongoing project that I will continue to develop over the next two years, and Making My Mark is a project that falls within the scope of my Beauracracy project. I am collecting images for these longer term pieces of work, but focusing on mental health and social control are my priorities. Being a photographer doesn’t limit me to learning only from photography. Composition, lighting, subject, object and balance can be studied by viewing art, sculpture, theatre and movies. I can’t get out to a gallery at the moment because of managing health and prior commitments. But I can still observe, evaluate, critique, learn and develop. Game of Thrones is amazing. Reading the books was a joy and I’m loving watching the box sets. One more series to go and then I’m ready for July. Bring it on. But enough of the thrill of the story, where does it fit in to developing as a photographer? White balance is new to me. I’ve been taking photos and then making use of lightroom to process my images. “But Richard” – I hear you say – “if you learn how to manipulate and use white balance you have more creative control in your camera”. and that’s where game of thrones comes in. Game of Thrones is set across a vast continent – snow in the far north, seasonal inland areas, hot coastal cities and desserts. Scenes are shot outdoors, inside tents, in rooms with a mix of day light and candles, in vaults, cellars and temples with only candles for lighting (I’m beginning to see where additional lighting is used of screen too). I’m starting to notice blue lighting, yellow lighting and white (bleach) lighting. Today I saw series 5 episode 9 – the fighting pits in Mereen, and it made sense of what I had read about low saturation with high vibrance. The skin tones were natural and the colours quite muted but still observable. It created a natural scene in the arena where the subject (fighting in the pits) and the object (the fighters) were dominant. I’ve also been evaluating and deleting photos from the airshow I went to last weekend. I took around 3000 photos and I’m having to be stricter with myself than I have been in the past. Is this a good quality photo? Will I really use this photo? Is this photo of a good enough quality to send to the subject? I often give photos to people. For example with the Tour de Yorkshire I sent photos to the teams and riders. If it’s a no to any of those questions I make a quick mental note of why I’m rejecting the image and how I could have taken it differently. Time to read then bed. Night.